A fascinating reflection of the history of American theatre. 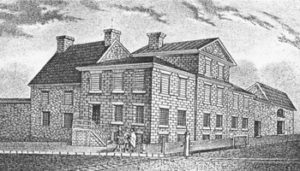 A sketch of Lancaster’s pre-Revolutionary jail. The location where Christopher Hager would later build Fulton Hall. Christopher Hager, a Lancaster merchant and civic leader, had a dream—to create a building that would serve as a community center for meetings, lectures, concerts, and theatrical performances. He commissioned the renowned Philadelphia architect Samuel Sloan (who later designed the Lancaster County Courthouse) to create this building, which was erected in 1852. Named Fulton Hall, after the county’s steam engine pioneer, Robert Fulton, it was built on the foundation of Lancaster’s pre-Revolutionary jail, where in 1763, a vigilante gang known as the “Paxtang Boys” massacred the last of the Conestoga Indians being held there for their protection. This was a monumental event throughout the colonies and became the subject matter for the first plays ever written on American soil – A Dialogue Between Andrew Trueman and Thomas Zealot About the Killing the Indians at Cannestogoe and Lancaster and The Paxton Boys, a Farce. The exterior wall of the jail courtyard is now the back wall of the theatre. The first musical concert at Fulton Hall was by violinist Ole Bull and 9-year-old soprano Adelina Patti, to raise money for a settlement of Scandinavians in Potter County. Mark Twain and Horace Greeley were among the lecturers who came to Fulton Hall, and theatrical performances included Harriet Beecher Stowe’s Uncle Tom’s Cabin. In 1856, the hall was sold to Blasius Yecker, a harness worker, and Hilaire Zaepfel, a hotelkeeper. They enlarged the stage and added new seats and ventilating devices to attract larger traveling productions and audiences. Thirteen years later, Zaepfel sold his interest to Yecker, who initiated a major renovation following the Civil War. Architect Edwin Forrest Durang (a descendant of America’s first actor, John Durang, a Lancaster native) lowered the auditorium, added space for stage rigging, constructed a proscenium arch extending 21 feet above the stage, and added the first balcony. According to old photographs, the name was changed to “Yecker’s Fulton Opera House” at this time. The grand opening, on October 2, 1873, was a performance of Othello, benefiting widows and orphans of the Civil War. Famous performers who subsequently graced the stage were Maude Adams, John Drew, Lily Langtry, and Modejeska. 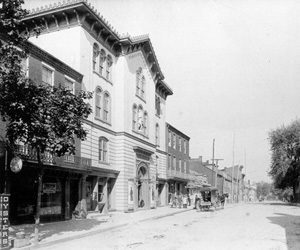 A view of the Fulton Opera House from North Prince St. circa 1900. Yecker’s son Charles took over the Fulton in 1903 and commissioned local architect C. Emlen Urban to redesign the interior in neo-classic style. Performance space was again enlarged and eight box seats were added, as well as the second balcony or “Peanut Gallery” which was fashioned with wooden benches, plus the grand staircase and foyers that still exist today. 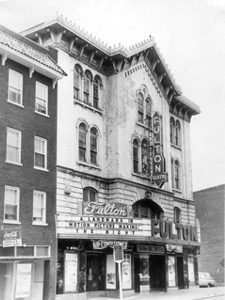 The Fulton subsequently played host to Sarah Bernhardt, Goerge M. Cohan, and a production of Ben Hur, complete with a live chariot race. The Fulton was considered the Queen of the Roadhouses. After 1910, movies began to pull audiences away from live theatre attendance, and with fewer traveling shows available, Yecker instituted his own stock company. By 1920, these shows included burlesque, which led to a Lancaster group called The Law and Order Society to have Yecker arrested for “exhibiting immoral shows.” He sold the building, which eventually came under the ownership of Ralph W. Coho, who began showing rerun movies, interspersed with a few stage shows. In 1931, Ethel Barrymore appeared in a play called The Love Duel, and the Drama Club of Lancaster presented an amateur production of George Kelly’s The Torch Bearers. The newer theatres on North Queen Street were drawing audiences with first run movies, and as the years went by, the Fulton became a second-rate movie house, its stage empty of performers. In the early 1950’s, a writer named Eugene Burr wrote an article for the New York theatre Playbill suggesting that the Fulton become a memorial to actor John Durang. Readers sent copies to Joe Kingston, the entertainment editor of the Lancaster Intelligencer Journal, who launched a campaign to restore the theatre as a home for local productions, musical events, and touring companies, organizing a “grand reopening” celebration on the occasion of the Fulton’s 100th anniversary to stir interest. In 1957, new management repositioned the theatre as an art movie house, with occasional stage performances. Over the next few years, a local production of Thornton Wilder’s Our Town with Victor Jorre as guest star, and a traveling production of Arthur Miller’s A View from the Bridge starring Luther Adler were presented. Plans for a season of summer theatre were announced, and most importantly a group of interested citizens began to raise money to purchase the building as a not-for-profit foundation. The Fulton Opera House Foundation was formed in 1963 with Nathaniel E. Hager, whose great grandfather had founded Fulton Hall, as its president, and a Board of community leaders. A purchase price of $55,000 was negotiated, and fund-raising began for the purchase and renovation. Fulton Opera House circa 1950. The Foundation began presenting a few first-run movies to bring in money, such as The Sound of Music and Thunderball. As repainting of the interior began, they also produced a few stage shows, including How to Succeed in Business and The Odd Couple, and hosted performances by the Lancaster Opera Workshop. The Fulton also became the performing home of the Lancaster Symphony Orchestra, and an annual musical presented by the Lancaster Kiwanis Club. In 1969, a community theatre group, Actors Company of Pennsylvania, began presenting musicals and plays on the Fulton stage. This was also the year that the theatre was designated a National Historic Landmark. By now the Fulton was totally committed to being a performing arts center for the community, with no more movies! Through the 70’s and 80’s, as the Fulton continued to rent the stage to community groups, it began producing shows of its own, eventually becoming a professional regional theatre in association with Actor’s Equity Association in 1983. It also created The Theatre for Young Audiences program, which is today the most extensive touring program of its kind in Pennsylvania. In 1989, the Fulton Board launched The Landmark Campaign to raise the funds to restore the theatre to its original Victorian elegance, while adding new office and lobby facilities, better seating, new dressing rooms, a flexible studio theatre, and enhanced technical facilities. After shutting down in January 1995 for the reconstruction, the Fulton lit up again on October 14, 1995 with a Gala Reopening performance of the Stephen Sondheim musical, Company. To further strengthen its position as a production company, the Fulton merged with the Actors’ Company of Pennsylvania beginning with its 1995-96 season. This merger helped to clarify the theatre’s focus on production and out-reach programs. Today’s view of the Fulton’s renovated interior. The Fulton is enjoying continued growth as it builds its reputation as a producer of professional, exciting theatre – award-winning favorites, classic plays, and World Premieres of commissioned work – while continuing to serve other performing arts groups such as the Lancaster Symphony Orchestra and Opera Lancaster. We believe that Christopher Hager would be proud to see how his dream survived and prospered. A historic landmark. A contemporary theatre. The Fulton Opera House is one of only eight theatres in the United States recognized as a National Historic Landmark. Located on the first block of North Prince Street in downtown Lancaster, Pennsylvania, it combines the elegance of Victorian architecture with the amenities and technical resources of a modern theatre. 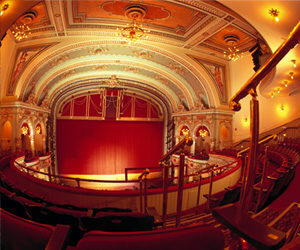 A $9.5 million renovation and expansion project initiated by the Fulton Opera House Board of Trustees was completed in 1995. In addition to restoring the splendor of the interior, new facilities were added for the comfort and convenience of the audience, to expand office space, and to make state-of-the-art improvements to the theatre itself. The construction of an annex adjacent to the original building allowed for the addition of a new two-story atrium lobby, new office space on the third floor, and an elevator serving all levels. A previously acquired building on the South side was remodeled to include a new box office and additional restrooms. The ground level below the stage now provides group and individual dressing rooms, an assembly area with kitchen facilities, a wardrobe room, and a large orchestra pit. The reconfigured auditorium area, with 684 seats, has orchestra seating on the first level, a second level mezzanine, and third level gallery seating. In addition to the four orchestra and balcony boxes near the stage, there are now accessible boxes at the rear of the theatre, as well as other accessible seating areas. New sound and light booths control updated technical systems, including a sound system for the hearing impaired and a View-Via-Headphones system for the visually impaired. For smaller productions, the fourth level of the building features a 100-seat flexible studio theatre that also serves as a rehearsal hall. Special attention has been paid to preserving and enhancing the historical integrity of the architectural features. The new box office rests behind the facade of an earlier version. The wooden statue of Robert Fulton, that originally adorned the front of the building, is restored and displayed in the lobby. The exterior statue is a replica of the original.